Fish, like all animals, need food to survive. Our premium selection of fish food for koi and goldfish covers all major brands including Microbe-Lift, Hikari, Tetra, Blue Ridge, Dainichi, Aquascape, and more! We even carry Cichlid and Turtle food. Available in soft sticks, pellets, floating, and sinking foods for spring, summer and fall feeding. All Aquascape fish foods contain probiotics and quality ingredients. Scientifically formulated to provide all pond fish with premium nutrition at an affordable price. A completely balanced nutritional diet, perfect for koi and goldfish. Available in Growth, Color Rich, Wheatgerm, and Platinum Pro- a professional blend diet. Held to the highest quality standards in the world. Dainichi formulations originated at the most elite level of koi breeding in Japan. The only koi food in the world imported to Japan by top Niigata breeders. Hikari offers a wide variety of diets for goldfish, koi and tropical fish. All Hikari foods offer you superior results. Scientifically chosen top quality ingredients are blended together to create unique specialized formulas to help your koi and goldfish grow to be strong and beautiful. Laguna floating fish foods contains a balanced nutritional formula for all pond fish during the cooler and summer months. Growth and color enhancing foods are also available. Diets for tropical fish, each offering unique characteristics which enable it to be readily accepted by the specific fish it was developed for. Fish, like all animals, need food to survive. 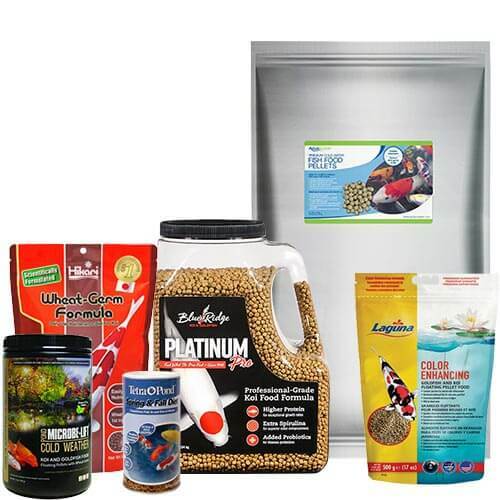 Our premium selection of fish food for koi and goldfish covers all major brands including Microbe-Lift, Hikari, Tetra, Blue Ridge, Dainichi, API, Aquascape, and more! We even carry Cichlid and Turtle food. Available in soft sticks, pellets, floating, and sinking foods for spring, summer and fall feeding.